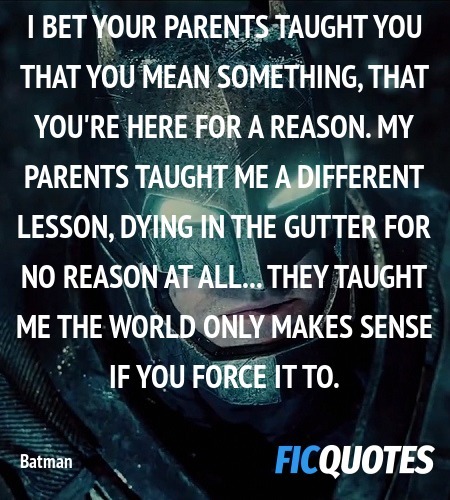 I bet your parents taught you that you mean something, that you're here for a reason. My parents taught me a different lesson, dying in the gutter for no reason at all... They taught me the world only makes sense if you force it to. You know, it's true what they say about little boys: born with no natural inclination to share. Oh, I don't think you've ever known a woman like me. Superman: [looking at wonder woman] Is she with you? Batman: I thought she was with you.